Presidential spokesman Salvador Panelo over the weekend claimed that the arbitral ruling was not shelved but could not be enforced. MANILA, Philippines — The Duterte administration never shelved the arbitral ruling on the South China Sea (SCS), Malacañang said yesterday, after the Philippines’ former top diplomat urged the government to “unshelve” the landmark decision that favored the country. “In the first place, this administration never shelved the arbitral ruling. It only remains unenforceable because no foreign force seems persuaded to help us enforce it,” Panelo said in a statement. “Neither do we have the capability of enforcing it alone by force, not to mention the fact that performing armed acts of enforcement could only trigger a bloody war that could cost the lives of our countrymen and destruction of properties in our land,” he added. Panelo noted that he had invoked the ruling when he reacted to a Chinese foreign ministry official who claimed that the Spratlys are part of China’s territory. “Assuming that we have temporarily shelved it as we pursue trade relations with China, the fact of invoking the arbitral ruling in our latest statement as well as asserting our sovereignty on our territory and right over our exclusive economic zone in response to an official statement from the Chinese government reiterating its claim of ownership and sovereignty over the disputed areas, effectively removed it from the shelf by virtue of such invocation and assertion,” the spokesman said. The Chinese foreign ministry reiterated that the Spratlys belong to China after President Duterte asked China to lay off Pag-asa, the largest of nine Philippine-controlled islets in the disputed Spratlys region. Panelo noted that the arbitral ruling, which is based on the United Nations Convention on the Law of the Sea (UNCLOS) and international law, is irreversible and should be respected by China. “(The ruling) has the stamp of permanence. We urge the Chinese government to respect it, and we hope the mechanism of bilateral negotiations between the countries forge a mutually satisfactory solution to the conflict based on internationally accepted principles of justice and reciprocity, as well as anchored on the dictates of each national security and aspirations of their people,” Panelo said. Panelo accused former foreign affairs secretary Albert del Rosario of “pretended patriotism,” saying the Philippines lost the Panatag or Scarborough Shoal to China when he was foreign affairs secretary. China occupied the traditional fishing ground in 2012. On Saturday, Del Rosario said it may be the “right time” to “unshelve” the arbitral ruling, citing what he described as “aggression and aggressive moves” of China. Del Rosario said Philippine officials should sit down with their Chinese counterparts for the enforcement of the ruling. The ruling, which was issued by a Hague-based tribunal in 2016, said there was no legal basis for China to claim historic rights to resources within the so-called nine-dash line, which demarcates China’s claims in the SCS. China refuses to recognize the ruling, which also states that some parts of SCS “fall within areas where only the Philippines possesses possible entitlements to maritime zones” under the UNCLOS. 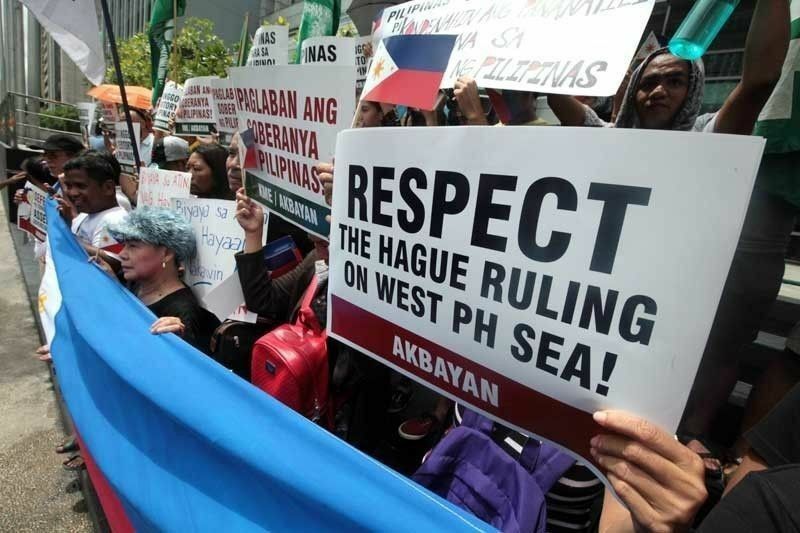 The Hague-based court also ruled that China has violated the Philippines’ sovereign rights by interfering with Filipino fishermen and building artificial islands in the area. The Philippines’ top diplomat believes China is far from ready to match US military capabilities. “China is far far far far behind the US in military destructive power,” Foreign Affairs Secretary Teodoro Locsin Jr. tweeted yesterday. Locsin noted that one book has said the US military will remain 500 years ahead of the rest of the militaries in the world for the next 500 years. “All aspiring powers must live with that prospect,” he said. But China has improved its military capabilities on land, sea, air and space. China’s military modernization reflects its economic power and growing leadership ambitions. China has also raised the costs of any potential intervention against its interests and include stronger expeditionary capabilities, including a military presence. Locsin said the US will remain the only military ally of the Philippines. “Why the US, the only world power that is a bastion of democracy and human rights, is and will remain our only military ally. We don’t need any other,” Locsin said. During a joint press conference with US Secretary of State Michael Pompeo in Manila in March, Locsin said “in vagueness lies the best deterrence” to describe the almost seven-decade Mutual Defense Treaty (MDT). The MDT provides that the Philippines and the US will come to each other’s aid in case of armed attacks. For his part, Defense Secretary Delfin Lorenzana stood firm yesterday on the country’s rights over disputed islands in the SCS, which China insists belong to them. “In short the Chinese have nothing working for them except their imagined historical claim,” Lorenzana stressed, in reaction to latest statements from Chinese officials.